Finding a stable surface at the right height for comfortable work is always a challenge. Uncaged Ergonomics’ WorkEZ line of portable, adjustable laptop (and tablet and reading) stands provides a solid range of flexibility with a few tradeoffs. And if you’ve ever wanted to try a standing-desk setup without spending the money on a new desk, the company offers relatively inexpensive packages for modifying your current desk for standing use. These flexible packages also let you switch easily between standing and sitting without adjusting a tabletop. I reviewed the $130 Executive Standing Desk combo, which consists of the $65 Executive stand (for your laptop), the $55 Professional stand (for your keyboard), and the $20 Mouse Pad (for your mouse or other input device). You can swap the Professional for the company’s shorter $49 Light stand for a bundle savings of $5. The difference between the two stands included in the Executive bundle are the maximum laptop size supported, the stand width, and the maximum height. Uncaged Ergonomics recommends no larger than a 16-inch laptop for the Professional’s 16-inch-wide platform, while the Executive’s 18-inch platform accommodates a 17-inch computer. (Each platform is 11 inches deep.) Any size keyboard will work with either component. The Professional extends no higher than 18 inches and has 18 inches of space between its legs, while the Executive rises to 24 inches with 22 inches between legs. I found when working on a couch or bed with just the Professional that it was a tight fit, even though I sit comfortably in a normal airline seat. Confusingly, some of Uncaged Ergonomics’ documentation claims the stands support up to 13 pounds each, while other docs say 20 pounds. Still, 13 lbs is more than enough for any laptop, and even many LCD and LED displays. All of the company’s stands are available in multiple colors and are made of aluminum to dissipate heat. The Executive stand comes with vents cut into its platform, while the Professional’s platform is solid. A $10 upgrade for the Executive adds a two-fan/USB-hub combo that requires USB power from your computer. The fans are hardly noticeable when active, and may be switched off. The Professional can add vents and fans (but no USB hub) for $5. Both stands are quite rigid, even when extended near the full height—a nice feat of design and engineering. There’s a little jitter from side to side as you type, but it’s not enough to put you off or start an oscillation pattern. The stands work great on top of a standard desk, as well as when used over your legs while sitting on, say, the floor or a bed…unless you sit crosslegged, thanks to the narrow space between the stand legs. The aforementioned Mouse Pad screws onto any leg of either stand. I didn’t find this accessory to be very useful, because even if you attach the pad as high as possible on the stand holding your keyboard or laptop, the pad is several inches lower than the stand’s main surface, making for poor ergonomics. Also, the bracket, while secure, is difficult to attach, and it must be removed in order to fully collapse the stand. The stands’ articulated-leg design has both advantages and disadvantages. Each joint can be locked into any of 24 positions, so with three joints in each leg, there are a very, very large number of ways the stands can be employed. However, even though the joints have numbered and tick-marked degree indicators, I still found it difficult to re-create a particular position I liked, as well as to get both sets of legs to the same place. Uncaged could do more to provide simple tools to mark positions to get back to them rapidly, such as color cues or position markers. If I were to use the stands permanently, I’d likely use fingernail polish or a colored permanent marker to indicate my preferred positions. Also, let’s not forget about fingers: While Uncaged includes several warnings about pinching, it’s simply inevitable that at some point you’ll get a finger squeezed when clicking and unclicking the legs—I did. It smarts, but I survived. The stands are surprisingly light, at 4 pounds for the Executive and 3 pounds for the Professional, and they fold up compactly enough to lug around. In fact, I’m surprised Uncaged doesn’t offer a custom carrying bag of some sort, as even though there are no sharp edges, there are rough ones—I wouldn’t throw either stand into a bag with a laptop or tablet—and each is too large stick in a backpack. Despite the solid construction, the company offers only a 30-day warranty against defects and assembly. Although Uncaged Ergonomics is a small company, the 30-day policy for problems not caused by the buyer seems rather restrictive. On the other hand, the company offers replacement legs for $3 each, which indicates it isn’t trying to make profits on parts. I recommend the individual stands for anyone who regularly needs to set up a good place to work where the available furniture or surfaces are poor options—assuming toting a collapsed stand is worth the effort. But I really like the Executive Standing Desk combo as an inexpensive way to try out the standing-desk experience without purchasing a new desk. 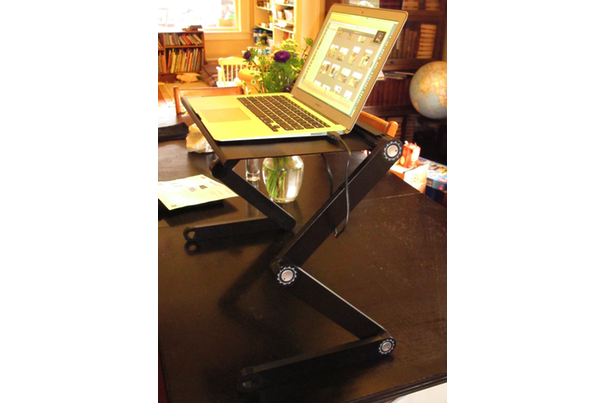 Its modular design also means you can move one or both stands and work in a sitting position. It’s a workable solution for varying your working position without the customary high price tag.